This book examines the local and international dynamics and strategies that have come to define the often violent relationship between Israel and Lebanon. Since the end of the Cold War, academic debate over the nature of war in the contemporary world has focused upon the asymmetric nature of conflict among a raft of failed or failing states, often held together by only a fragile notion of a shared communal destiny. Little scholarly attention has been paid, however, to one such conflict that predates the ending of the Cold War, yet still appears as intractable as ever: Israel’s hostile relationship with Lebanon and in particular, its standoff with the Lebanese Shi’a militia group, Hizbollah. As events surrounding the ‘Second Lebanon War’ in the summer of 2006 demonstrate, the clear potential for further cross border violence as well as the potential for a wider regional conflagration that embraces Damascus and Tehran remains as acute as ever. 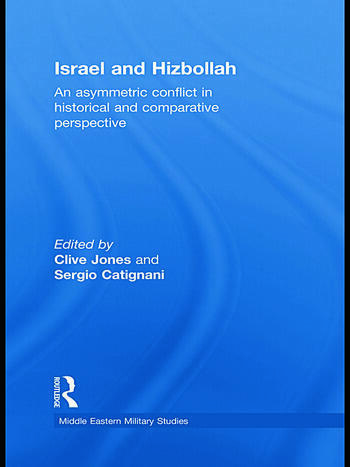 This book focuses on the historical background of the conflict, while also considering the role that other external actors, most notably Syria, Iran and the United Nations, play in influencing the conduct and outcomes of the Israeli-Lebanese conflict. In addition, it also looks at Hizbollah’s increasing sway in Lebanese domestic politics, its increased military cooperation with Iran and Syria, and the implications of such developments. This book will be of much interest to students of Middle Eastern politics, War and Conflict Studies, International Security and International Relations in general. Clive Jones is Professor of Middle East Studies and International Politics in the School of Politics and International Studies (POLIS), University of Leeds, UK. His books include Soviet Jewish Aliyah 1989-92 (1996), Israel: Challenges to Democracy, Identity and the State (with Emma Murphy, 2002), and co-editor The al-Aqsa Intifada: Between Terrorism and Civil War (2005). Sergio Catignani is Lecturer in Security and Strategic Studies and MA Programme Director for the MA in Security and Strategic Studies at the Department of Politics, University of Sussex. He is the author of Israeli Counter-Insurgency and the Intifadas: Dilemmas of a Conventional Army (2008). Clive Jones is Professor of Middle East Studies and International Politics in the School of Politics and International Studies (POLIS), University of Leeds, UK. His books include Soviet Jewish Aliyah 1989-92 (1996), Israel: Challenges to democracy, identity and the state (with Emma Murphy, 2002), and The al-Aqsa Intifada: between terrorism and civil war (co-editor, 2005). Sergio Catignani is Lecturer in Security and Strategic Studies at the Department of International Relations, University of Sussex. He is the author of Israeli Counter Insurgency and the Intifadas: dilemmas of a conventional army (2008).